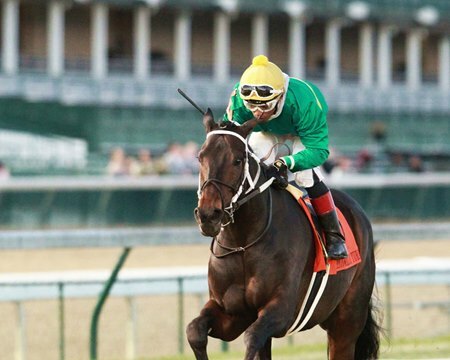 Louisville, KY (November 10, 2018)-Woodford Racing’s Hot Springs took an adventurous trip to victory Nov. 10 in the $100,000 Commonwealth Turf Stakes (G3T), but in the end picked up his first graded stakes win and preserved his unbeaten record on the Churchill Downs turf. The 3-year-old son of Uncle Mo entered the race off a victory in the Sept. 29 Jefferson Cup Stakes at Churchill for trainer Steve Asmussen, and was sent off as the 9-5 second choice in a field of seven under jockey Ricardo Santana Jr.
Away alertly from the outside post in the 1 1/16-mile test, Hot Springs at first appeared to struggle with the heavy going of a turf course listed as yielding. The bay colt dropped back to second-last behind a :24.81 opening quarter set by longshot Marzo, then brought up the rear as the half went in :49.64. Santana kept his cool, sought the shortest path to victory, and moved Hot Springs up the rail through three-quarters in 1:14.72. The duo stayed on the rail into the lane as Asmussen-trained stablemate Reride made his bid, then had to shift abruptly to the outside for running room just off that one’s heels. Santana sent Hot Springs through as the mile went in 1:40.38, and the colt responded with a fresh kick, which carried him across the line for a 1 1/2-length score. The final time was 1:46.97. “The track is pretty heavy. We got a lot of rain,” Santana said. “I was looking and watching replays with the weather like this, and a lot of the horses sat off it (and won) earlier in the day. Hot Springs broke his maiden June 3 beneath the Twin Spires by 4 1/4 lengths and wheeled back to score a 1 1/2-length allowance win June 29. After he finished second in the Kent Stakes (G3T) and fourth in the Saranac Stakes (G3T), he returned to Louisville and took the Jefferson Cup by a length. Hot Springs was bred in Kentucky by Bo Hirsch, out of the stakes-placed Victory Gallop mare Magical Victory, and was a $750,000 purchase by Lane’s End from Columbiana Farm’s consignment to the 2016 Keeneland September Yearling Sale. He improved his record to four wins and a second from seven starts, with earnings of $248,480.